The Producers of the annual Guitar Mash fundraiser share a passion for music that is participatory, recognizing that the guitar, a portable instrument that can relay feeling, can be a catalyst for sharing stories and songs. The first Guitar Mash “campfire jam” took place in 2012 at City Winery in New York City with the idea to connect people of all backgrounds, ages and abilities through music. 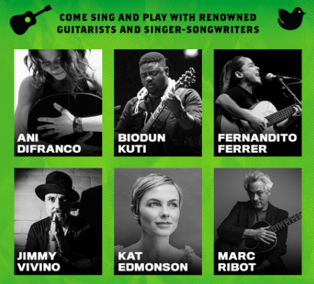 This year’s Guitar Mash will take place on November 18thand will be ‘headlined’ by Section 101 client Ani DiFranco. A unique and immersive musical experience, where artists break down the wall and invites the audience to play and sing along, DiFranco is a perfect fit given that this year’s theme of “Songs for Change” focuses on the power of music to generate awareness and bring people together. Guitar Mash works to raise money to offer at-need teens from the five boroughs the opportunity to come together for communal playing, songwriting, collaboration and more with educators and community-based organizations. You can buy a ticket to the Seventh Annual Guitar Mash here.